Kuo issued a trio of notes, copies of which were obtained by AppleInsider, offering supply chain chatter on the rumored handset. He predicts that both consumers and investors will be extremely happy with the new 6.1-inch handset, expected to hit a lower price point than the iPhone X by using an LCD display instead of OLED. "We are positive on the shipments outlook of the 6.1" LCD iPhone, and forecast it will have a weighting of around 50% in the new models in 2H18," Kuo wrote. 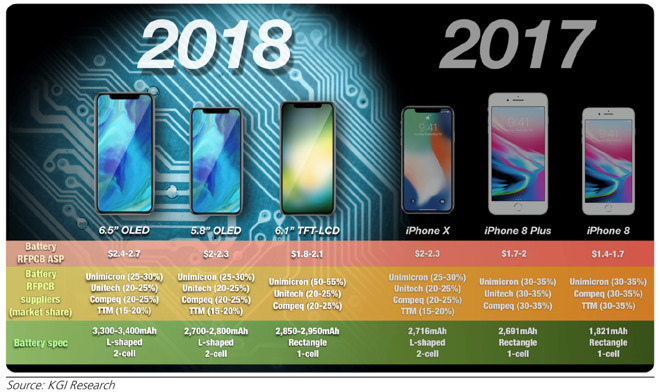 "Since the specs of the 6.1" LCD iPhone will not match up to those of the OLED models, we believe the supply chain investment themes for the new 6.1" LCD iPhone will more likely center around 'new entrants' and 'market share gainers,' rather than 'beneficiaries of spec upgrades ' or 'beneficiaries of ASP increase.'" He expects the premium LCD model will feature the same camera "notch" as found on the iPhone X, accommodating the Face ID array. And while it will have a larger screen than the 5.8-inch iPhone X, it's not expected to boast an edge-to-edge design, due to limitations of LCD display technology. Other details in Kuo's notes include the fact that the 6.1-inch model will have a rectangular-shaped battery that will cost more than the ones used in the iPhone 8 Series, but less expensive than the iPhone X. He believes that Unimicron will be the main supplier of batteries for that model. In terms of manufacturing, Kuo said Pegatron, Foxconn and Wistron will handle assembly, with Pegatron accounting for 60 percent of capacity. 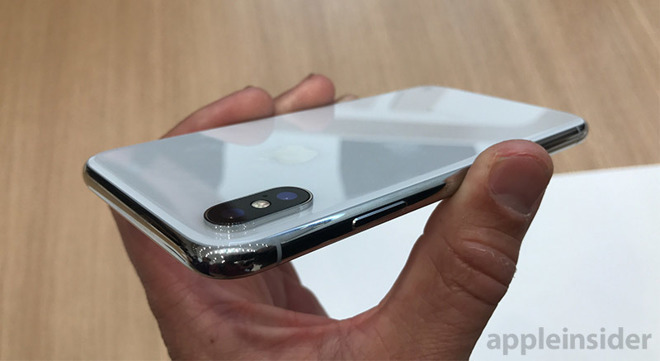 The 6.1-inch LCD iPhone is expected to be introduced alongside a successor to the 5.8-inch iPhone X, as well as a new jumbo-sized 6.5-inch "iPhone X Plus" with edge-to-edge OLED display. Kuo has been a strong source of information on Apple's future products for years. This month, he caused a controversy by saying Apple could stop manufacturing the iPhone X and allow a new 2018 model to replace it completely, rather than continuing to sell the 2017 model at a reduced price. The 6.1-inch LCD iPhone could help explain that strategy: By reaching a lower price point than the $999-and-up iPhone X, it could offer consumers some of the desirable features of the handset with minor trade-offs.